Simons, the 176-year-old fashion retailer from Quebec City, will open its first Calgary store on March 16, 2017. The downtown location at The Core Shopping Centre marks Simons’ 14th store, the second in Alberta. 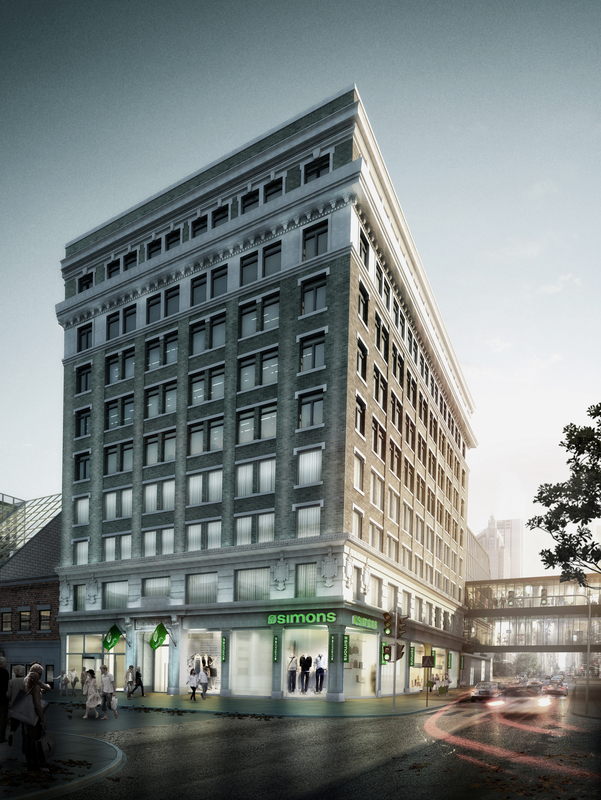 With a total of 95,000 square feet, the store makes up five floors in the Lancaster Building and the portions of the first, second and third floors of TD Square. The main floor of Simons runs an entire city block on 2nd Street between Stephen and 7th Avenues. Under the leadership of 20 Vic Property Management, the nine-storey tall Lancaster Building from 1919 was restored and renovated, allowing Simons to create a modern layer of retail space within an architecturally significant city structure. Local firm, McKinley Burkart, led Simons’ architectural and design plans with a vision to integrate the two buildings and revitalize the downtown streetscape. Simons houses an extensive and fashion-forward collection of its own exclusive and innovative private label brands for men and women, complemented by a selection of leading labels, exclusive discovery brands from around the world and an edited collection of international designers, making it well known for its exceptional selection of merchandise for everyone. Simons also carries home fashions for the bedroom, bathroom and kitchen. Art plays an important role in the design of all Simons stores and The Core location is no exception. Simons commissioned local Calgary artist Maya Gohill to install a three-storey painted mural which runs along the escalators in the Lancaster Building. Her satirical portraiture combines stylized animals, abstract figures and graphic backgrounds, all using a vibrant colour palette. Numerous other Calgary artists are also represented in the new Simons store. Megan Jentsch took to the outdoors to paint two huge graphic murals which appear on vinyl wallcoverings for high traffic areas in Twik and Djab. A new portrait (Poet #2) from internationally recognized Chris Cran will also live in the store. From a store design perspective, guests are greeted at street level with a ribbon-like curved floor-to-ceiling windowscape that creates visual continuity around both buildings. Upon entry, discovery of Simons’ eight branded environments begins. Twik for young female shoppers features sophisticated pinks and peaches, decorative panels of weaving and a large vintage inspired billboard sign. Edgy black and white graphics are reflected in fitting room wallpaper and as metal screens on wall fixtures in Icône for the modern women. 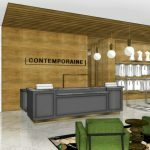 Contemporaine – classic, elegant fashions for women – uses warm woods with an art deco feel in its curved corners and eclectic furnishings. Women’s lingerie in Miiyu sits among soft, warm woods, blush pinks and organic patterns. Separate from apparel items, Simons’ home collection Maison has a warm grey environment with pops of bright green tiles and kitchen, bath and bedroom vignettes. 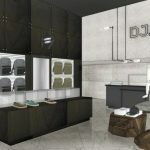 Djab for young men has a raw feel with concrete walls, industrial lighting and cityscape graphics. Le 31 for men uses a sophisticated palette with a mix of cerused wood and walnut paired with ink blue ombre patterns, and injects some fun with a small room called ‘The Brief’ – specifically for men’s underwear. Traditional gymnasiums inspire the men’s and women’s iFive activewear spaces with natural plywood and black exposed ceilings. Edito, for both men’s and women’s international designer collections, are defined with feature entrances and use elegant darker tones for a more luxurious feel. Ève café, with its menu of hot and cold, sweet and savoury treats, acts as a transition area between women’s on levels one and two; and men’s on levels three and four. Warm light wood paneling covers every surface – floors, walls and the ceiling – enveloping the café and creating a unique nook in the store. Dark green banquettes with bistro tables combined with high counters and bar stools provide seating for 40. Many other architectural and design elements appear throughout the store in order to enhance the shopping experience. The upper level windows of the Lancaster Building are lined with softly lit drapery to create a glowing exterior façade and a dramatic skylight illuminates the asymmetrical multi-floor opening visible from all levels. Tying the Lancaster Building together is a set of bold walnut stairs that connect all five floors from Customer Service on the lower level all the way up to men’s on the fourth floor. The staircase features a frame of blackened steel chevron rails that creates a dramatic focal point in the store.